Aggersborg is the largest of Denmark's former Viking ring castles, and one of the largest archaeological sites in Denmark. It is located near Aggersund on the north side of the Limfjord. It consists of a circular rampart surrounded by a ditch. Four main roads arranged in a cross connects the castle center with the outer ring. The roads were tunneled under the outer rampart, leaving the circular structure intact. The ring castle had an inner diameter of 240 metres. The ditch was located eight metres outside of the rampart, and was approximately 1.3 metres deep. The wall is believed to have been four metres tall. The rampart was constructed of soil and turf, reinforced and clad with oak wood. The rampart formed the basis for a wooden parapet. Smaller streets were located within the four main sections of the fortress. The modern Aggersborg is a reconstruction created in the 1990s. It is lower than the original fortress. Reconstruction of a Viking house. This house is located at the ring castle of Fyrkat. Golden armband found near Aggersborg. Dating the structure has proven difficult, since the archaeological site has also been the site of an Iron Age village. The ring castle is believed to have been constructed around 980 during the reign of king Harold Bluetooth and / or Sweyn Forkbeard. Five of the six ring castles in historical Denmark have been dated to this era. The structure was completed within one or two years, and only used for a short period of time; between five and twenty years. Archaeologists have estimated that the ring castle could hold a 5,000-man garrison, located in 48 longhouses. Twelve longhouses were located in each quadrant, all located on a north-south or west-east axis. No remains of the actual houses exist, but proof of the location of the walls has been found. The individual houses are believed to have been similar to the form seen on the Camnin chest, a house-shaped reliquary, as well as on house-shaped tombstones in England. The houses had curved roofs and curved sides, similar to the form of a ship; 32.5 metres long and 8.5 metres across. They were divided in a long inner hall, around 19 metres long, with smaller rooms at the end. It is estimated that construction of a single Aggersborg house required 66 large oak trees. The entire structure, housing included, is estimated to have used 5,000 large oaks. A large number of archaeological finds have been discovered on the site, including many imported luxury items. Examples include beads of mountain crystal and pieces of glass jars. A damaged golden ring has been discovered on the site as well; a replica is displayed in the Aggersborg museum. Aggersborg was located both protected but also easily accessible by ship, since both ends of the Limfjord were open waterways when the fortress was constructed. It is speculated that ships had to be carried on land past Løgstørgrunde. Aggersborg was also strategically located at one of the three ancient crossings of the Hærvejen (army road) across the Limfjord. The two other crossings existed to the north of Farstrup, and near Lindholm Høje in Ålborg, respectively. No conclusive data yet exists whether Aggersborg was a stronghold controlling trade routes or whether its primary function was as a barracks / training grounds in connection with Sweyn Forkbeard's Viking raids on England. This page originally based on the page da:Aggersborg from the Danish Wikipedia accessed on 26 February 2006. Information plaques located near Aggersborg. "Making Place for a Viking Fortress. 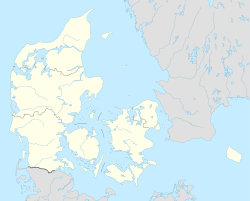 An archaeological and geophysical reassessment of Aggersborg, Denmark". Internet Archaeology. doi:10.11141/ia.36.2.